Forks Meal Planner - Help & FAQ - How do I update changes to an existing plan? All Categories ​>​ Customizing Meal Plans ​>​ How do I update changes to an existing plan? If you have changed the serving size or intolerance settings for your account, changes will be applied to all upcoming plans. If you would like the changes to apply instantly, there's a quick way to do this. 1. You can access the service from a desktop computer, tablet, or mobile device. 2. Choose the weekly plan that you would like to apply the changes to. 3. Locate the 'Gear' or 'Three dots' icon at the top right of the plan that you want to make the changes to. 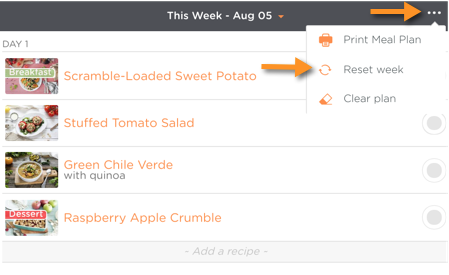 This will remove any customizations you may have made to the plan or grocery list, but will apply your updated preferences to the plan once it resets. Your plan will now be refreshed and reflect your updated preferences.